The U.S. dollar is trading higher against all of the major currencies this morning as investors reward President Trump’s progress in talks with North Korea. He confirmed that CIA Chief Mike Pompeo met with Kim Jong Un in North Korea last week, paving the way for an official conversation between Trump and Kim. The dollar should be able to hold onto its gains with the Fed’s beige Book scheduled for release this afternoon, U.S. bond yields moving higher and Dow futures pointing to a positive open. The weakest currency is sterling which was hit by another round of softer data. UK CPI growth slowed to 0.1% in the month of March against expectations for 0.3% rise causing year over year growth to slow to 2.5% from 2.7%. Sterling is vulnerable to a deeper correction following softer wages yesterday. 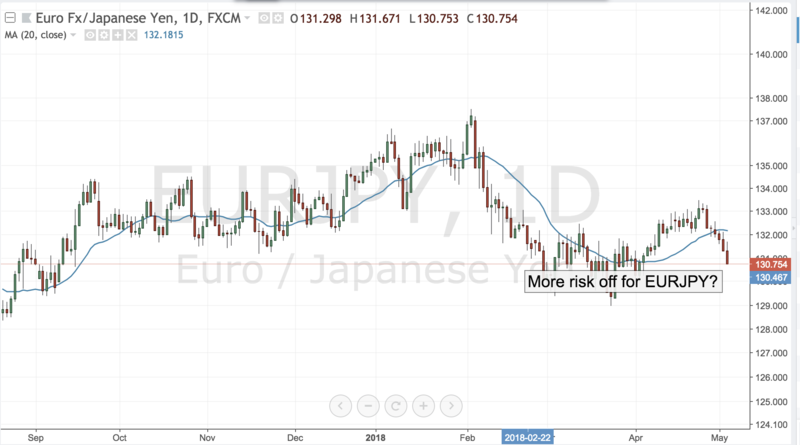 The strongest currency is the euro which refuses to fall in lockstep with its peers partly because of Iran’s decision to stop using dollars in its transactions -- a move that other nations could follow. The biggest event risk today is the Bank of Canada’s monetary policy announcement -- no changes are expected but recent data improvements could encourage optimism. Most of the major currency pairs are under pressure this morning after yesterday’s sell-off in U.S. equities. Although Asian and European stocks were flat investors remain nervous about softer U.S. data and political uncertainty in the Trump Administration. Larry Kudlow is widely expected to be named Gary Cohn’s replacement today but Attorney General Jeff Sessions could be the next one to go. USD/JPY is under the greatest pressure but 105.50 is important support. If the market interprets Kudlow’s nomination as positive for the risk, that level will hold rather than break. The euro is trading heavy after ECB President Draghi’s dovish comments but its losses are moderate compared to some of the other major currencies -- on a flow basis it looks like it wants to take another trip below 1.2350. Sterling is quickly closing in on 1.3900, an important support level. All 3 of the commodity currencies are trading lower this morning with the Australian dollar leading the slide. The New Zealand dollar is surprisingly resilient considering the market’s initial disappointment with Q4 GDP. USD/CAD is on the move again this morning and eyeing another run to 1.30. We don’t think this level will break but the pair could come close to testing it.